Eventually, we’re going to run out of ways to describe the incredible ways in which this 2012 Orioles team continues to win. On Wednesday night, it looked like the Tampa Bay Rays had the O’s against the ropes. With closer Jim Johnson on to try to extend a 2-2 tie into the bottom of the ninth, Tampa appeared to have covered the corners with two outs on an Evan Longoria infield single. Longoria hit a slow tapper down the third base line – because, of course he did; Johnson leads the league in those kind of dribblers by a wide margin – and Random Tampa Baserunner (like Random Henchman in a James Bond movie) who had just stolen second cruised in to third as Manny Machado bare handed the roller. It was obvious to all that Manny didn’t have a play at first, and his wisest course of action was to “eat” the ball. Machado, though, showed some 20-year old swagger (a word I’m about 5-10 years too old to use) and pump faked the throw to first. Random Tampa Baserunner – (Ok, it was Rich Thompson) bit, ready to go home if the youngster made the mistake of throwing the ball to first. Machado turned after his pump fake and tossed to J.J. Hardy, who had snuck in to cover third behind Thompson, who himself was now several steps from third base. And just like that, the threat was over, and the O’s had a chance for the walk-off win. Who led off the O’s half of the inning? Machado, of course (as so often happens…). The rookie hit one off the end of the bat that fell in to left field, largely because the Tampa outfield was playing extremely deep to try to cut off any deep knocks. Following the single, Robert Andino laid down a perfect bunt to move Machado to second with one out. Nate McLouth stepped to the plate, and took the Kyle Farnsworth offering deep into the right field corner. When the ball was hit, I didn’t think it had any chance to be fair, but, sure enough, it hit about a foot inside the yellow line to the right of the Esskay Scoreboard. The O’s are now 80-62, a season-high 18 games over .500. It’s the first time they’ve won at least 80 games in a season since 1997, and they remain in a tie for the AL East lead with the New York Yankees. By virtue of winning the first two games of the series against Tampa, they’ve extended their lead over the Rays for the second wild card spot to three games. They go for the sweep Thursday at 12:35, as Wei-Yin Chen takes on Jeremy Hellickson. I can’t wait to get out to the yard. See you there. 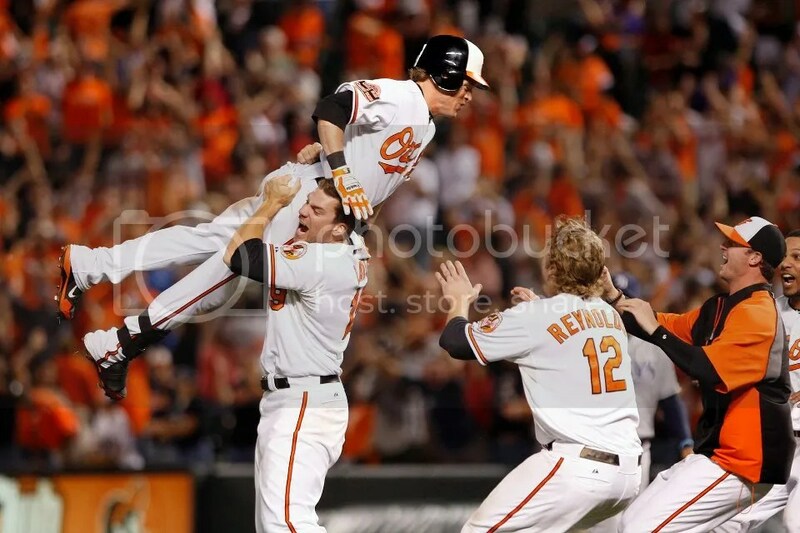 This entry was posted on September 12, 2012 at 11:04 pm and is filed under Orioles. You can follow any responses to this entry through the RSS 2.0 feed. You can skip to the end and leave a response. Pinging is currently not allowed.